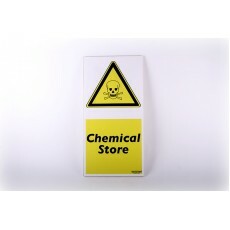 This sign is to be placed on the outside of your chemical store, placing chemical store signs around your chemical storage area is essential to make people aware that there are dangerous chemicals locked in this store. Suitable for cross compliance audit purposes. 1ft x 1ft corry board. Strong, durable and weather resistant.